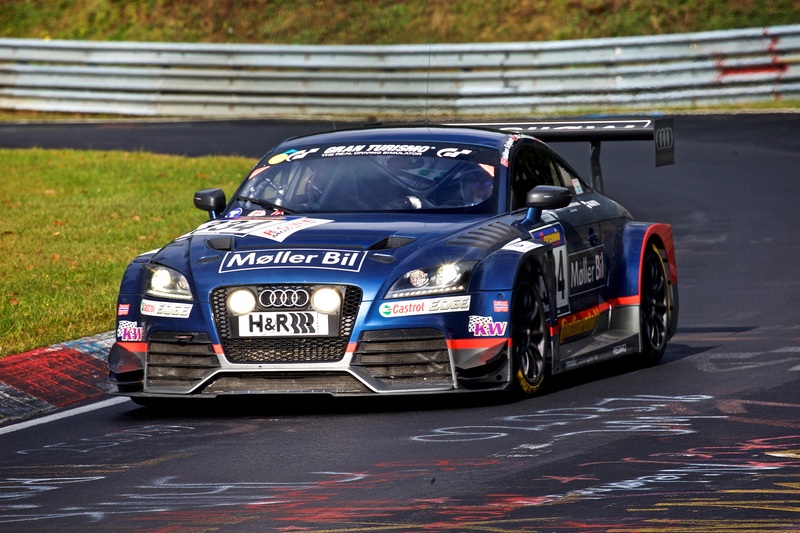 We ended a fantastic season with another victory on the Nürburgring Nordschleife on Saturday. We have been on the podium in all races this year. Three victories, one second and one third in five races. That’s the results of Møller Bil Motorsport’s VLN-campaign in 2016. Our best season ever and actually more points in average per race than the team who won the VLN-championship (and do all ten races). The weather was a little cooler this time, and our car likes the cold temperatures. I have compared and analyzed lap times from when we drive in cold conditions (under 10 degrees) and when we drive in hot conditions (over 20 degrees), and we lose around five seconds just because of the temperature and lack of power. On Saturday it was raining, and we had to qualify on rain tires. This was our first run on a very wet track this year and I used some laps to get used to the feeling. I was last out in the qualifying and took it easy on the first lap. On the second lap I tried to go faster, but another car was blocking me almost half the lap. My time was 10.47, five seconds behind Kenneth’s best time. We were third in class. I did the start and it was still raining. Into the first corner I couldn’t see a thing so I took it easy, and that was a wise decision since two cars tangled just in front of me. I tried to find a rhythm on the slippery track, but it was difficult since this was my first laps on a really wet track this season. Quite early I was all on my own in second place, and I drove with quite a big margin and to avoid any costly mistakes. I was some seconds faster than all the competitors in SP3T on each lap, except the leading Seat with Nürburgring-instructor Andy Gülden behind the wheel. His first laps must have been some of the most impressive I’ve ever seen on the Nordschleife and he was flying. After the race I heard that the Seat-team had some different tires than us, that maybe helped them a bit, but it was very impressive anyhow. We were second when Håkon took over. At this time it was still raining and he went out on rain tires. But it soon dried up, and Håkon lost some time to the competitors on slicks. When Kenneth took over we lost some time on a few set-up-changes, and suddenly Kenneth was fourth. But he drove really fast and was soon second. Towards the end the leading Seat had to retire with technical trouble, and we won the race. So maybe a little lucky, but “to finish first, first you have to finish”. And it was quite a few good teams competing like the Opel factory team with their new TCR-car, a couple of Audi TT’s and a couple of TCR-Seat’s. Kenneth also set the fastest lap of the race in our class. That was by the way something I did in August, and I had pole in the last race, so this has been a good season. A couple of times I have also been a tenth or two from both pole and fastest lap of the race, and with three wins I have now 11 class wins in VLN. Håkon Schjærin has 20 and is the Norwegian driver with most wins in VLN. This has been a really successful year for us, and we are really proud of what we have achieved over the years. When I first started in the VLN we started really from scratch and drove with a homemade car that was minutes behind the best. But we managed to develop the car to become a winner. Then we had some years with a lot of technical trouble, but the last four seasons have been incredible. When I finally got some competitive equipment, started to win a lot of races, take poles, fastest laps and beat factory drivers at the world’s most demanding race track, I was already in my thirties though – and had two kids and two jobs, so a professional career was out of the question. Møller Bil Motorsport has therefore been the perfect team for me these years. I have been extremely happy to be a part of this team since 2005, and the team really feels like family. And speaking of family. 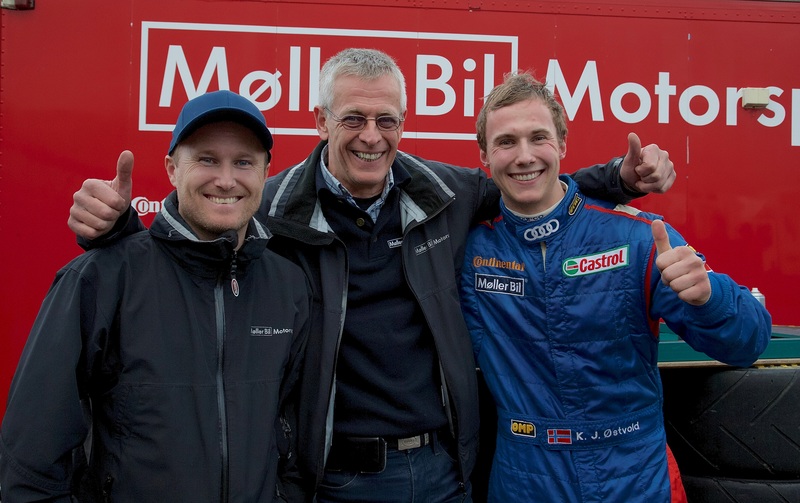 The last years with Møller Bil Motorsport has also been perfect to combine with my life as a family father. Not too many races, and the possibility to travel home to my family Saturday night after the races. In Møller Bil Motorsport I’m also treated as a professional racer, although I’m a semi-professional one like my team mates. But when I’m at the Nürburgring I’m not treated as a part-time-racer part-time-commentator, but just as a racer. And that I’m forever thankful for. Photos: Pål Henning Berg (Ferskvann Reklamebyrå).